It’s very hard for me to see that Hancock Fabrics or Joann has a sale because I know me. My husband will take me for a notion and because I can reason with him during a sale I’ll leave with a few yards of fabric. Over the years I’ve accumulated a pretty decent stash so I’ve decided that unless I ABSOLUTELY must buy extra fabric for a sewing project I will only use what I have on hand or buy second-hand fabric. Not only will I save money for other things but doing this will allow me to be creative, if you will. 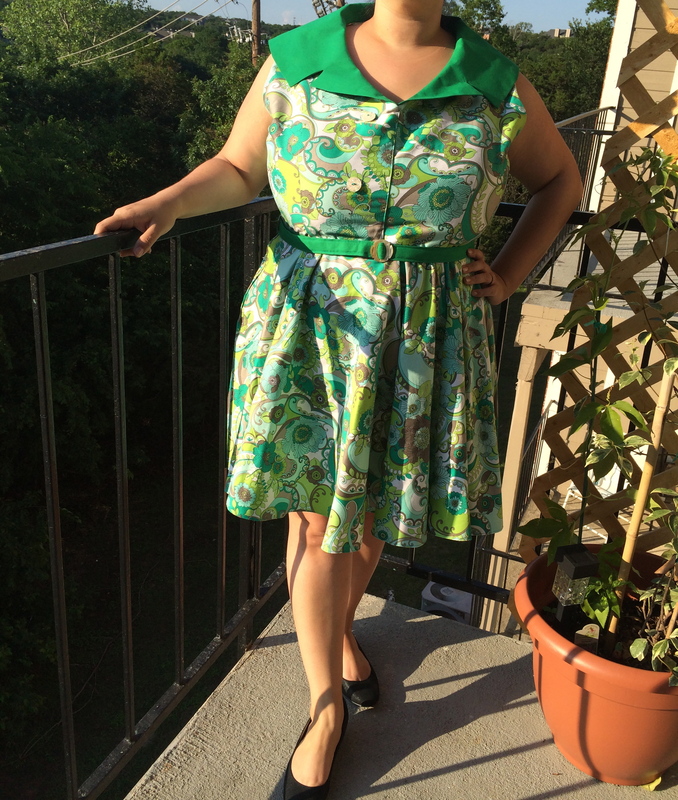 This dress is the first of many projects made from my stash. Over a year ago I was at Hancock Fabrics for a sale and saw the softest, high quality cotton that was originally priced at $19.99 a yard marked down to $4.99!!! It was such a great deal I couldn’t pass it up, although I wish I had gotten more info about the fabric and remembered how much I bought! Haha. 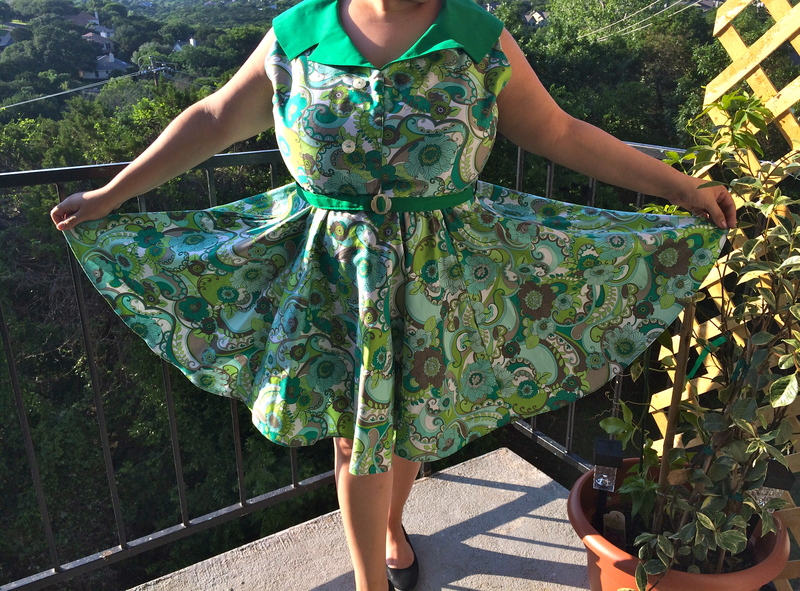 I made my first circle skirt out of it and only wore it once because I felt the material was way too heavy to be a skirt so I looked through my scraps and had just enough to make a bodice. The collar would be contrasting, but I knew it was what I wanted. I know it looks as if everything is normal but no. Apparently I traced the buttonholes an inch and a half further than they needed to be so it made the bodice super small! Ooops. Since I never got any info on the fabric and I can’t find more, I improvised. Inside the bodice underneath the buttonhole, I sewed scraps around the perimeter so the button can actually look like it’s functional(call me MacGuyver haha). I also had to sew the bodice shut so I can actually wear it. 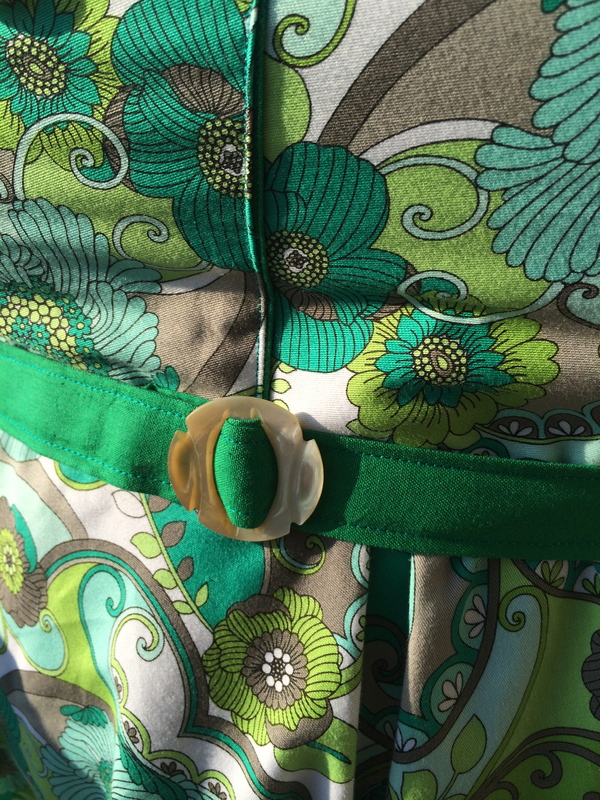 I installed a 14″ zipper on the right side instead of the left so getting in and out of the dress isn’t an issue. Since I’m barely learning how to do a full bust adjustment after the fact, I feel like I could’ve used one in this instance. Other than that, I’m pleased with the outcome! 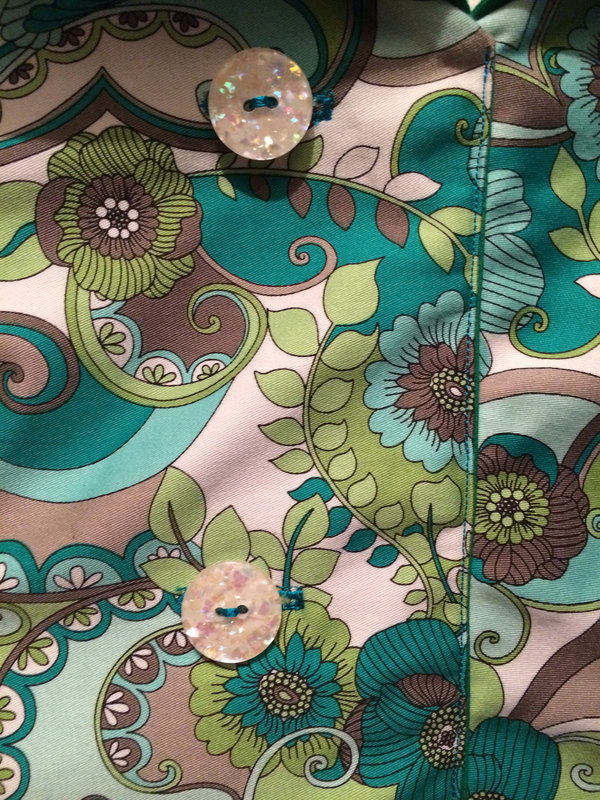 The pattern envelope calls for 1 1/2″ wide ribbon for a belt but I opted for making something a little sturdier. 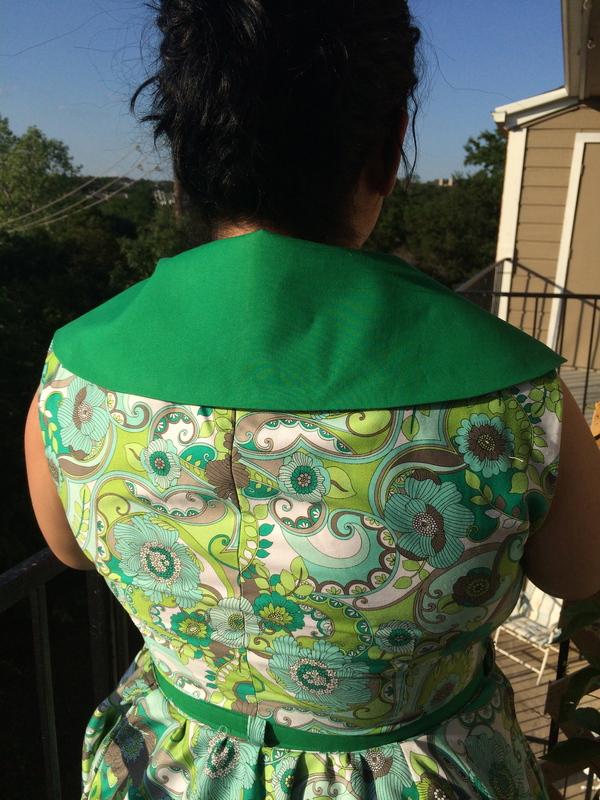 I used leftover scraps from the collar and some heavy interfacing and although I hate to admit it, I didn’t measure anything! My bad. 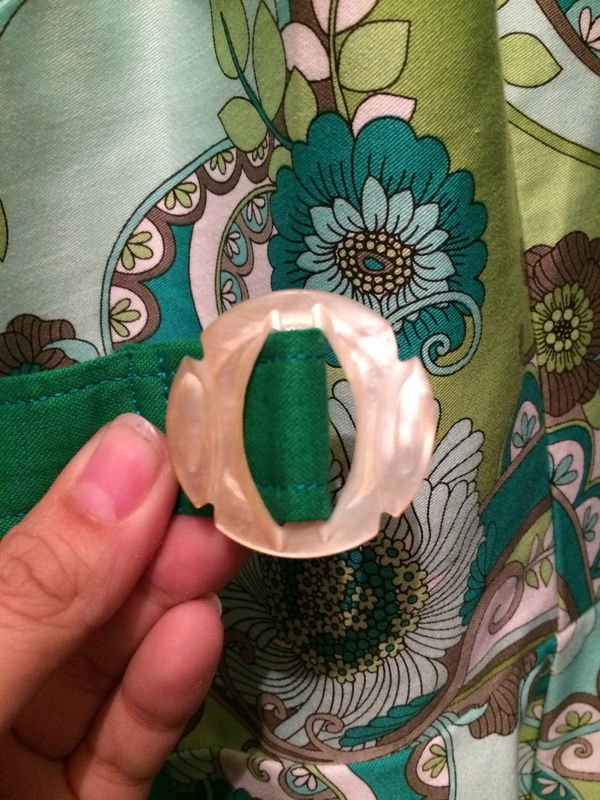 I also added belt loops…not authentic but eh! It works. Probably 3 years ago my MIL let me rummage through a bunch of old buttons that were from her mother, so I have lots of goodies yet to be used until this belt! I found this lovely vintage shell belt buckle from the collection that just HAD to be used for this. Everything came out so nicely and I’m very happy, although now I need shoes to match.